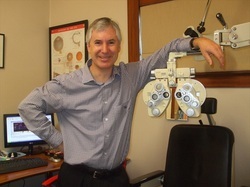 Stuart has been looking after eyes for 25 years. He has accumulated a wealth of experience from working in inner city practice, rural practice and shopping mall based practice. As well as prescribing spectacles and fitting contact lenses Stuart is able to diagnose eye disease, treat anterior eye conditions, remove foreign bodies from the cornea and monitor systemic conditions that can affect the eyes and vision. He has a particular skill for contact lens fitting and children's visual development. In his spare time he plays keyboard and indoor soccer. He also plays a pretty mean game of chess.